Today is the 130th birthday of the artist Diego Rivera. His full name is a sentence: Diego María de la Concepción Juan Nepomuceno Estanislao de la Rivera y Barrientos Acosta y Rodríguez. I first experienced Diego Rivera at Interlochen Center for the Arts when I stumbled across a book of his work in the library. I used to go to the library a lot in the summertime, it was cool and quiet and a nice place to read for a couple hours. My aunt was the librarian, so that was nice. I remember looking at the photographs of his murals and reading the dimensions and being absolutely amazed. I remember loving the complexity in his artistry of simple subjects. It is like he took his time to honor every detail of the task of bundling this basket of produce, it just was so wonderful to understand that art was partially bringing light to and celebrating the every day existence of everyone. It became much more accessible and personal. The world is a better place because Diego was in it and still feels the loss that he has left. BEST KNOWN FOR: Painter and muralist Diego Rivera sought to make art that reflected the lives of the working class and native peoples of Mexico. Now thought to be one of the leading artists of the 20th century, Diego Rivera was born on December 8, 1886, in Guanajuato, Mexico. His passion for art emerged early on. He began drawing as a child. Around the age of 10, Rivera went to study art at the San Carlos Academy of Fine Arts in Mexico City. One of his early influences was artist José Posada who ran a print shop near Rivera’s school. In 1907, Rivera traveled to Europe to further his art studies. There, he befriended many leading artists of the day, including Pablo Picasso. Rivera was also able to view influential works by Paul Gaugin and Henri Matisse, among others. Diego Rivera had some success as a Cubist painter in Europe, but the course of world events would strongly change the style and subject of his work. Inspired by the political ideals of the Mexican Revolution (1914-15) and the Russian Revolution (1917), Rivera wanted to make art that reflected the lives of the working class and native peoples of Mexico. He developed an interest in making murals during a trip to Italy, finding inspiration in the Renaissance frescos there. Returning to Mexico, Rivera began to express his artistic ideas about Mexico. He received funding from the government to create a series of murals about the country’s people and its history on the walls of public buildings. In 1922, Rivera completed the first of the murals at the Escuela Nacional Preparatoria in Mexico City. Known for numerous dalliances with women, Rivera married fellow artist Frida Kahlo in 1929. He already had been twice before he wed Kahlo, who was 20 years his junior, and had several children from his past relationships. Rivera and Kahlo shared an interest in radical politics and Marxism. In the 1930s and ’40s, Diego Rivera painted several murals in the United States. Some of his works created controversy, especially the one he did for the Rockefeller family in the RCA building in New York City. The mural, known as “Man at the Crossroads,” featured a portrait of Russian Communist leader Vladimir Lenin. The artist had reportedly included Lenin in his piece to portray the turbulent political atmosphere at the time, which was largely defined by conflicting capitalist and socialist ideologies and escalating fears surrounding the Communist Party. The Rockefellers disliked Rivera’s insertion of Lenin and, thusly, asked Rivera to remove the portrait, but the painter refused. The Rockefellers then had Rivera stop work on the mural. In the late 1930s, Rivera went through a slow period, in terms of work. He had no major mural commissions around this time so he devoted himself to painting other works. While they always had a stormy relationship, Rivera and Kahlo decided to divorce in 1939. But the pair reunited the following year and remarried. The couple hosted Communist exile Leon Trotsky at their home during this period. Diego Rivera lost his wife, Frida Kahlo, in 1954. The following year, He married Emma Hurtado, his art dealer. By this time, Rivera’s health was in decline. He had traveled abroad for cancer treatment, but doctors were unable to cure him. Diego Rivera died of heart failure on November 24, 1957, in Mexico City, Mexico. 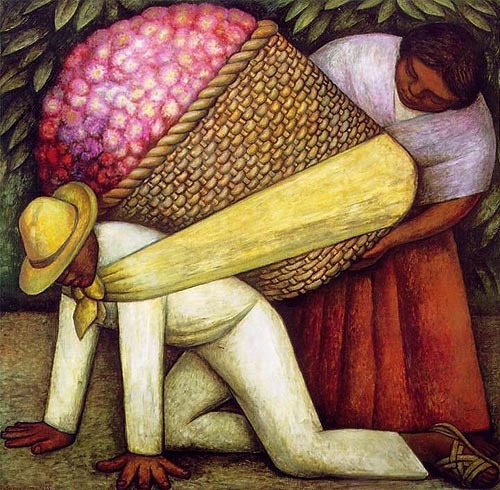 Since his death, Diego Rivera is remembered as an important figure in 20th century art. His childhood home is now a museum in Mexico. His life and relationship with Frida Kahlo has been remained a subject of great fascination and speculation. On the big screen, actor Ruben Blades portrayed Rivera in the 1999 movie Cradle Will Rock. Alfred Molina later brought Rivera to life, co-starring with Salma Hayek in the 2002 acclaimed biographical film Frida.